Sir David Anthony Simmons K.A., B.C.H., Q.C., LL.M. (Lond.) was appointed to the JLSC in accordance with section 105(1)(d). Sir David entered the Faculty of Law at the London School of Economics and Political Science in 1960 and graduated with an LL.B. degree in 1963. He was awarded an LL.M. degree in 1965. Sir David lectured in law in London until his return to Barbados in 1970. Between 1970 and 1974, Sir David was a part-time lecturer in law at the Faculty of Law of the University of the West Indies. Sir David has had an outstanding career as a lawyer in Barbados and was appointed Queen's Counsel in 1984. He served continuously for 25 years in the Parliament of Barbados from February 1976 to August 2001, on which date he retired from active politics. Twice he served as Attorney-General of Barbados; first, from 1985 to 1986, and, more recently, from September 1994 to August 2001. On many occasions during the latter period, Sir David acted as Prime Minister of Barbados. He assumed office as the 12th Chief Justice of Barbados on 1 January 2002. In 2003, he was made an Honorary Fellow of the U.W.I. and was also awarded the Honorary Degree of Doctor of Laws (LL.D.) by the University of London - the first Caribbean person to be accorded that high distinction by that University. In 2006, Sir David was elected as an Honorary Bencher of the Honorable Society of Lincoln's Inn, the Inn of Court at which he qualified as a Barrister-at-Law. 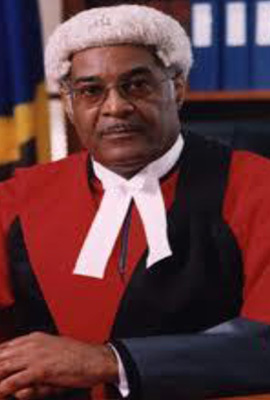 As Attorney-General, Sir David presided over many initiatives and esteemed conferences, including being Chairman of the Preparatory Committee to establish the Caribbean Court of Justice (1999 to 2001) and first Chairman of the Regional Judicial and Legal Services Commission (2003 to 2004). In 2001, for his contribution to public service, law and politics, Sir David was awarded the Barbados Centennial Honour (B.C.H. ), and Barbados' highest national honour, Knight of St. Andrew (K.A.). He is currently Chairman of the Integrity Commission in Turks and Caicos and Chairman of the Commission of Enquiry into the 1990 coup attempt in Trinidad. Sir David served as a member from 1 August 2010 to 31 July 2014. He was reappointed to serve from 1 August 2014 to 31 July 2016.